Or so one of my clients said to me the other day. I believe it was meant in a good way – we were discussing the merits of planning and preparation and it seems I fall at one very far end of the spectrum in that regard. I believe ‘anally retentive’ is another phrase that’s sometimes used to describe my approach! But her comment made me stop and think. Because she’s right, I do like to plan for every eventuality in a given situation. For example, preparing for the implementation of GDPR last year; doing a presentation to a room full of business owners; or planning the giant surprise birthday party I’m currently planning. She made me wonder why I plan and prepare in such detail? Fear is definitely a driver – fear of having a chaotic situation spiralling out of my control. I mean, no-one wants to be the conference speaker whose laptop won’t connect to the AV and there’s no backup of the presentation! But the over-riding driver for me is the desire to simply move from A to B in a straight line. Having decided that B is my destination, I can’t help myself thinking through all the things that might stop me getting there and planning a way to avoid the pitfalls. It’s second nature to me. And so, in that sense, I accept I’m not ‘normal’. And nor could I ever be because it’s part of my makeup. But it’s also a skill and a habit I’ve honed and developed because I have very direct evidence that it gets me better results. Meaning that my destination B is much more likely to materialise. Normal, in my experience, is to hope for the best and to be surprised if anything gets in the way. Meaning there is rarely a backup plan. And very little opportunity to keep moving forward when something goes awry. B becomes a distant dream. Success in business is ALL about knowing where you are starting from, your A. And knowing your destination, your B. And putting a plan – and backup plan – in place to ensure you get there. Things like, being REALLY clear how – and by how much – you want to grow your business in the next 12 months. Understanding where your customers come from, and planning to do more that activity to ensure you achieve your growth target. Getting your processes in order for the bigger business and getting the right staff in and trained, ready to go. Having a review process in place to see if you are on track – and a back up plan if you are not. Because we all know that being super successful isn’t NORMAL – most businesses muddle along in the grey zone doing ‘ok’. Take it from me, real success is much more likely to become ‘normal’ for you if you plan for it. 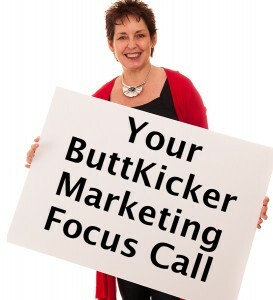 And if you are one of those people who recognises that they’re not going to get a plan together for your business growth without some help, you really DO need to book in for one of my ButtKicker Focus Calls where I’ll help you get some direction.